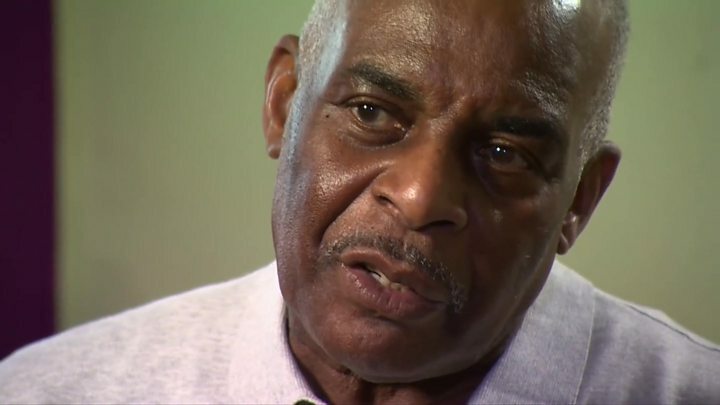 Neville Lawrence: "I forgive them all for the murder of my son"
The father of murdered teenager Stephen Lawrence says he has forgiven his son's killers, nearly 25 years after the attack.Dr Neville Lawrence the decision had been "one of the hardest things", but he still wanted justice. The murder "opened the country's eyes" to racism, he added.Stephen, 18, was stabbed in an attack by five white youths on 22 April 1993, at a bus stop in south-east London.Two men were jailed for life in 2012.Last week the Metropolitan Police said that, despite rigorous efforts, its inquiry was "unlikely to progress". Police had previously apologised for failures in the investigation. Speaking to the BBC, Dr Lawrence said he still felt the pain of his first child being "murdered for senseless reasons".But he said that while he wanted all the killers to face justice, he had forgiven them.Dr Lawrence, who now supports families of other murdered young people, said: "It was one of the hardest things for me to say to myself, 'I forgive you for the murder of my son'. "He said forgiveness had made his life "a long way better now", and "maybe if I had done it earlier it would have been better for me as well". Gary Dobson was jailed for a minimum of 15 years and two months, and David Norris for 14 years and three months in January 2012.The pair were convicted after microscopic samples of Stephen Lawrence's DNA were found on the clothes they had been wearing in the attack.Three others were publicly named as suspects but police have said fresh prosecutions are unlikely unless new evidence is found.Dr Lawrence said the killers "made my son into a legend" and the impact the death had on British society was "amazing".He said: "It has helped me because in a sense it is helping others. "Although I've lost Stephen I've gained something else in that my son is not going to be forgotten." Mr Lawrence said it was not the legacy he would have wanted for his son: "He wanted be an architect. "I thought I would see quite a few buildings if he had qualified and I thought that was the way I was going to remember him, but unfortunately that is not the way. "The Met Police said it has reviewed the investigation but "without new information [it] is unlikely to progress further".Chris Le Pere, the senior investigator, said it was "never too late" for someone to "do the right thing" and come forward with information.Dr Lawrence said he accepted the police's decision but he did not want to see the case closed completely.He said: "My son is in the ground in Jamaica. "[The killers] have walked around, some of them for 25 years, the only time I was able to see anything of my son was going to his grave. "You do something, you should pay for it. "Dr Lawrence has said he remains hopeful that - with the publicity around the 25th anniversary of his son's death and a BBC documentary to air this week - someone will come forward with information.